2 by 3 Heroes: How to spend 180 minutes. How to spend 180 minutes. On Sunday, I had to head up a bit north to Hillside, IL. My daughter needed to attend a driving school class. Yeah - it was court mandated. However, I am pretty certain she understood her mistakes and should be much more careful behind the wheel. Four hour class, so what was a father to do? Well, when one of your LCSs locations is just 15 minutes up the road, the decisions are made for you. Luckily, I knew who was behind the counter, so it was nice to dig through a lot of commons boxes and just shoot the crap while digging. When I left as Ray was closing the door, he even thanked me for coming by and keeping him company. That is not to say I was the only one in there for the 3 hours. But it's always nicer when you know someone. All my digging netted me just about 150 cards for my binders. 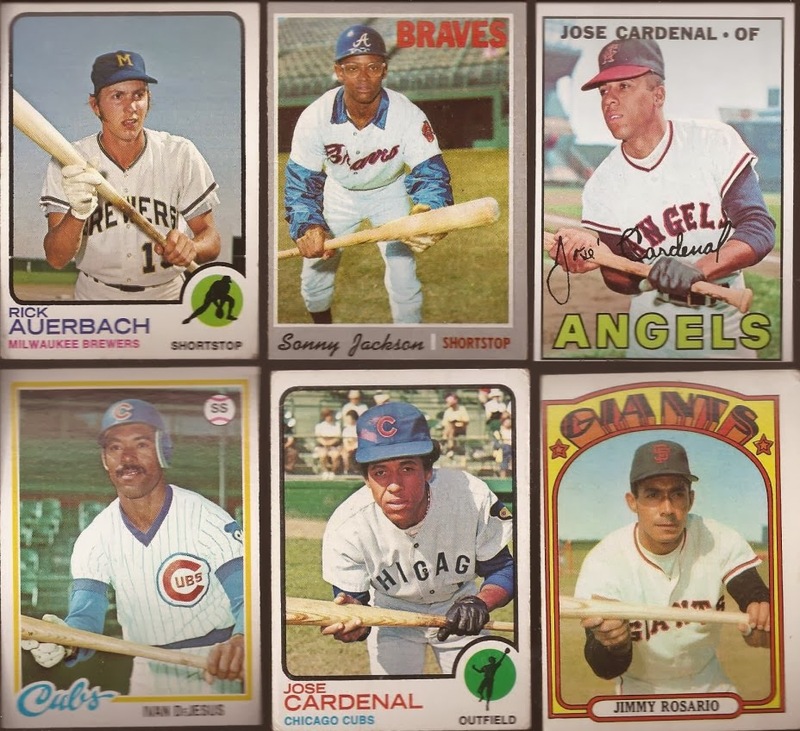 About 50 of them hit on set builds from A&G to Golden Age to Heritage (including 3 SPs and a buyback), but I really did the damage on my special collections - bunts, DPs, throwback, miscuts and broken bats. Those two broken bats are two not even on my radar, so nice pickups for the pages. 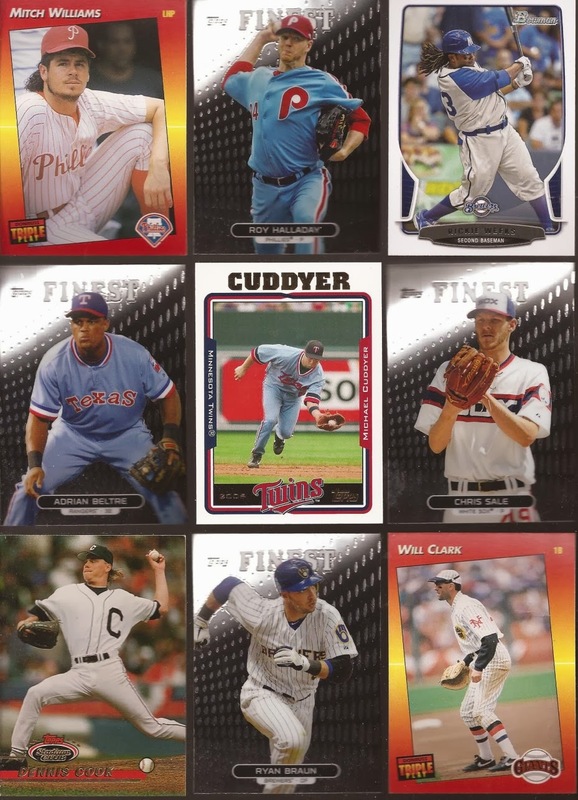 For throwbacks, I picked up 15 new cards. I believe that is all four throwbacks in 2013 Finest. That '93 Stadium Club is a nice early view of an old Cleveland Indians '30 jersey. It only improves when we get to the bunting cards. We have pitchers laying it down. As well as other stars. That Chamberlain in the center is a throwback - I need a 2nd. Can bunting get better? You know it can!!! 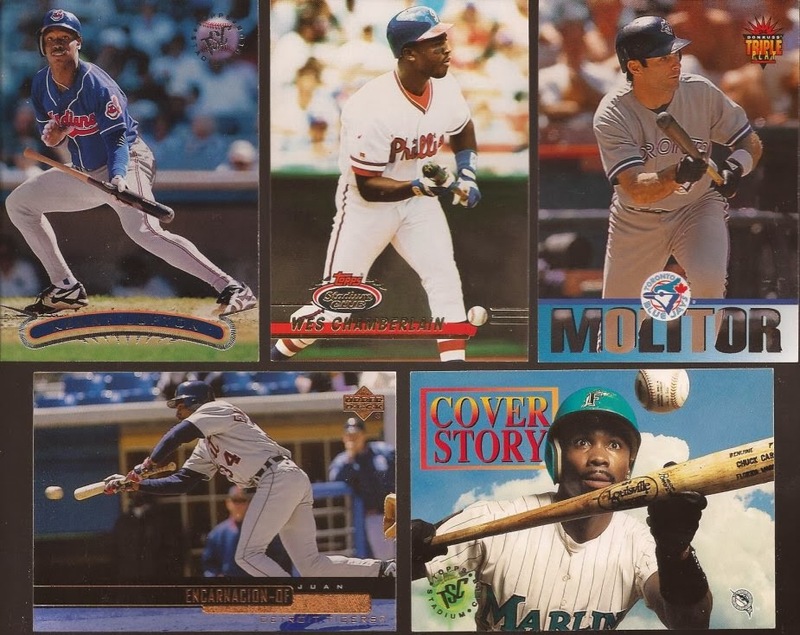 I think Jose is using the same batting glove in both cards. Total of 35 new bunting cards. And while dime boxes seem to have dried up recently for me and double play cards, I hit the jackpot in the commons boxes. I think I muttered "God, I miss Stadium Club" about a dozen times yesterday. 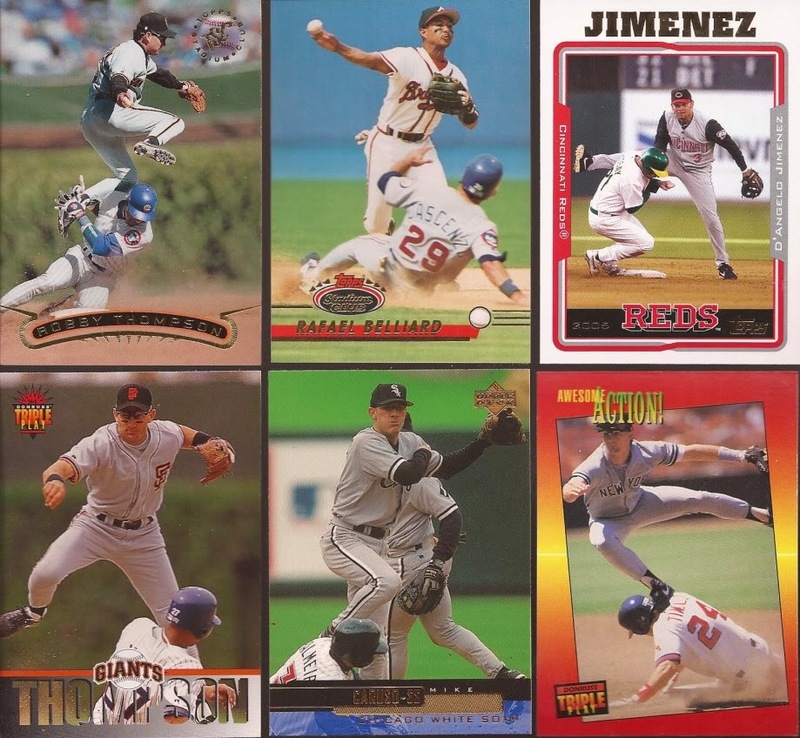 Easily 25-35 cards I purchased were from that brand. Great multi exposure on the Womack. The Bell? Throwback. More dupes needed. Only four vintage turns. But do I love that WS card. 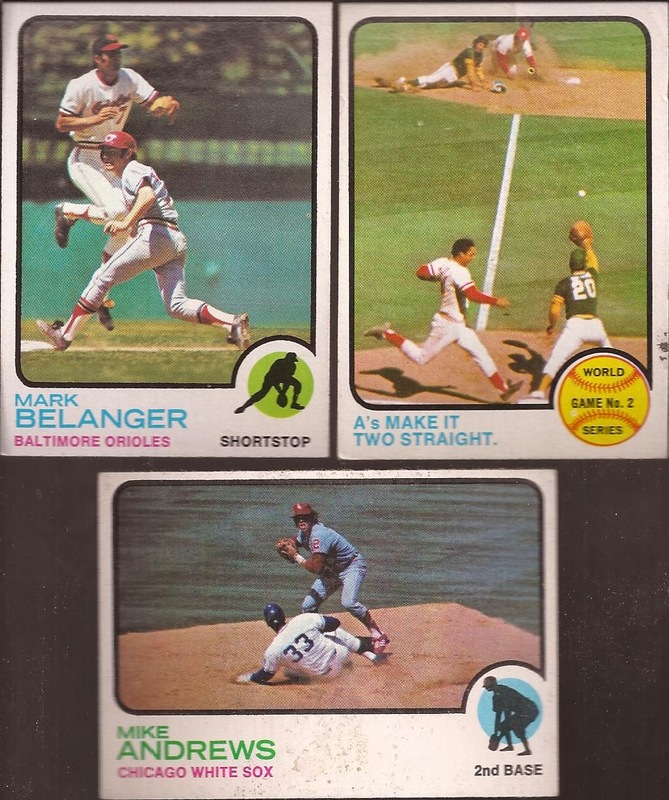 More proof of the greatness of '73 Topps. While the reason for the trip stunk, it turned into a great way of passing time. That Chuck Carr is spectacular. 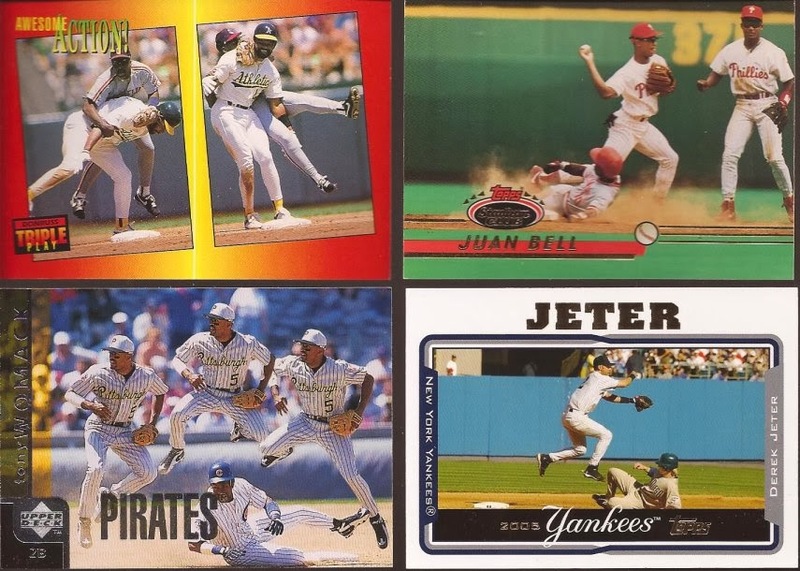 That Womack is definitely one of my favorite double play cards. I second that. Gotta add it to my multiple exposure cardboard list. Sunday SIL: Other collections, I have. Yes.